If we were all training at "Muscle Beach", we would probably not need any vitamin D3 caps to get our 25(OH)D levels into the recovery friendly 50ng/ml zone. They would already be there! Ok, I know this looks odd, but it's really total coincidence that all the interesting vitamin D research is published in the last weeks of the year. Unlike the latest vitamin D articles, i.e. today's SuppVersity article does yet leave little room for speculations about it's real-world significance. I mean, how could it, if the paper it discusses is titled "Supplemental vitamin D enhances the recovery in peak isometric force shortly after intense exercise" (Barker. 2013). The title does yet not "say it all". Moreover, what it doesn't tell you is the most important piece of information. The study period was short (35 days) the dose of vitamin D was relatively high (4,000IU) was conducted with "reportedly healthy and modestly active (30 minute of continuous physical activity at least 3 time/week) adult men with low, albeit normal vitamin D levels (25(OH)D ~ 30ng/ml)! The otherwise almost obligatory question about the potential relevance in "normal" human beings does thus become superfluous - and this is true for all the observations the scientists made, i.e. ... and, not to forget, the enhanced recovery in peak isometric force the researchers observed in their subjects after these had performed 10 sets of 10 repetitive eccentric-concentric jumps with a load of 75% of their respective body mass on their shoulders and a 20 sec rest period between each set. For the researchers this is a model of a "muscle damaging event" (P< 0.05; ≈8% at 24-h), which was, as it was to be expected, associated with an increase in the circulating levels of the "liver enzymes" alanine (ALT) and aspartate (AST) aminotransferase, of which many medical textbook will tell incorrectly tell you that they would indicate a strain on the liver / liver damage, when they are actually only markers of increase amino acid catabolism. 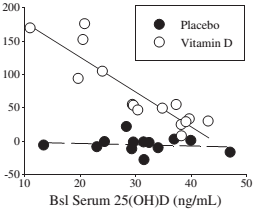 The attenuation (P< 0.05) of the immediate and delayed (48-h, 72-h, or 168-h) increase in these enzymes in the vitamin D supplemented group is thus an indicator of "muscle protective" or at least general protein sparing effects of supplementally increased vitamin D levels. Figure 1: Strength recovery (%) from immediately post to 24 post workout, left; serum ALT values immediately after, 24h, 72h, and 168h after the exercise test (Barker. 2013). The fact that the alleged decrease in muscle damage did not correlate with a decrease in muscle soreness does or doesn't negate the purported muscle protective effects of vitamin D. There is, as you should remember from Alex' excellent articles about DOMS, after all no direct link between ALT, AST, muscle damage and delayed onset muscle soreness, aka DOMS (learn more about DOMS). What is clear, though is that there was no consistent trend in the subjective measures of muscle soreness in the study at hand, so that Barker et al. are right, when they state that "[s]upplemental vitamin D was ineffective at abrogating muscle soreness in the SSC leg" (Barker. 2013). If it's an improvement in pain you are looking for, you'd be better off with one of the techniques Alex' discussed in part I of his article series. Figure 2: It looks boring, but the linear association between the subjects baseline levels and the change in 25(OH)D and the ceiling effect at ~50ng/ml are also important results of the study at hand (Barker. 2013). Bottom line: I guess you can't have it all, so I would not mourn over the lack of effect on muscle soreness. I mean, come on (! ), this is one out of thousand (literally!) vitamin D studies with real-world relevance for you and me. A study that confirms that getting your 25(OH)D levels into the 50ng/ml range can actually have small, but stat. significant beneficial effects on your exercise performance (without negative effects on calcium, btw). Furthermore, the fact that this increase to the 50ng/ml+ was achieved in all subjects with "only" 4,000IU D3 within only 35 days and was directly associated to their respective baseline level is an intruiging result on its own (see Figure 2). It does after all provide you with a rough guideline of what you have to do if your next 25(OH)D blood test comes back way below the 50ng/ml margin. Against that background, there is no reason to frown about the fact that we still don't really know what vitamin D actually does to elicit its ameliorative effects on the performance decline in response to potentially muscle damaging stretch-shortening contraction. This was beyond the scope of the study at hand and cannot be investigated in isolated muscle cells... much contrary to the previously reported anabolic effects in the Petri dish, by the way, which may be exciting, but more or less irrelevant, if we can't observe corresponding increases in muscle hypertrophy in the real world. 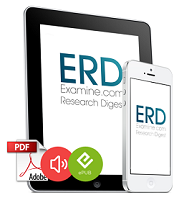 Barker, T., Schneider, E. D., Dixon, B. M., Henriksen, V. T., & Weaver, L. K. (2013). Supplemental vitamin D enhances the recovery in peak isometric force shortly after intense exercise. Nutrition & Metabolism, 10(1), 69.